On Saturday, March 3, 2018, SOLO concludes its season with a double-bill performance of Puccini’s comical Gianni Schicchi and Leoncavallo’s powerful Pagliacci. Stephanie will be performing the roles of Nedda in Pagliacci and Lauretta in Gianni Schicchi. 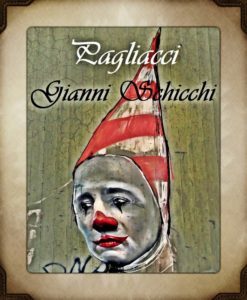 Pagliacci; literal translation, Clowns, is an Italian opera in a prologue and two acts, with music and libretto by Ruggero Leoncavallo. Gianni Schicchi is a comic opera in one act by Giacomo Puccini to an Italian libretto by Giovacchino Forzano, composed in 1917–18. The libretto is based on an incident mentioned in Dante’s Divine Comedy.